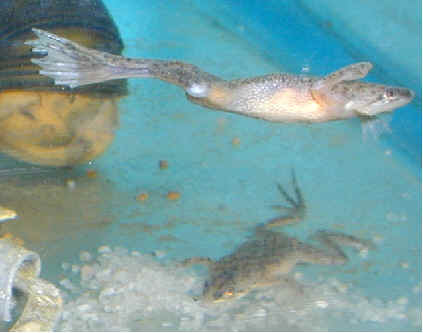 Swim on over to these great Dwarf Frog sites! This site is a great site on ADF. It is full of information on their care and raising. It even has GREAT pictures of ADF eggs and tadpoles. A must visit site for those who haven't been here. Would you like to discuss your Dwarf Frog more? Would you like a second opinion from many experienced dwarf frog hobbiests? Then come on over and join this group! This group is full of people who focus on keeping all types of aquatic frogs, xenopus laevis, xenopus muelleri, hymenochirus, pipa pipa, etc. I help moderate this group and I must say the people here are the greatest and will help you out as best they can and give you great ideas. Feel free to come over and join! Probably the most informative ADF site on the web. It goes in depth into all aspects of dwarf frogs. It even has daily and very detailed breeding logs. I highly reccomend this site. Do you want more indepth information on your aquatic frog? Then this is the discussion group for you! It is full of expert members who are willing to help with the simplest question to the most complex of information. This is a great group for current updates and the latest news on anything you need to know. If you know of any highly educational African Dwarf Frog sites please send me an email and let me know. There is not a whole lot of good information on these frogs and I'd like to see more.